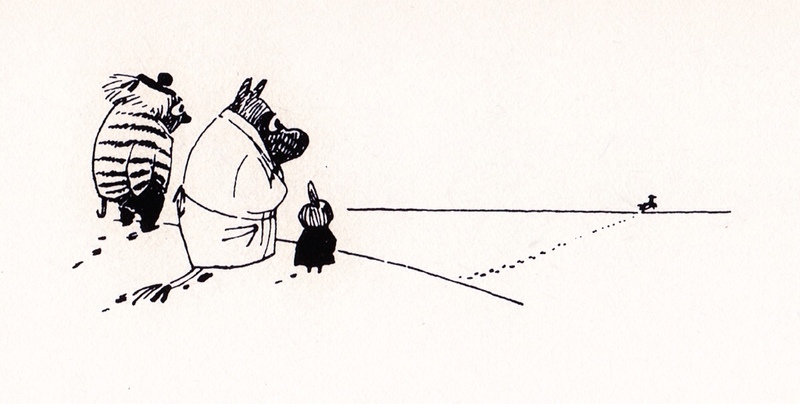 Here begins the year of Tove Jansson. 100 years since her birth, The Egg theatre in Bath bring us the UK’s very first staging of one of her Moomin stories (ridiculous!). The year also sees their first original motion picture outing in Moomins on the Riviera and a stage musical of Moominsummer Madness. But I’ll be surprised if any of them are quite as special as Horse + Bamboo’s puppet production of Moominland Midwinter. You know you’re in for something good before the play begins. The stage is flanked by reproductions of the beautiful blue / black forest from the book Moomin, Mimble and Little My, complete with unsettling glowing eyes. This is followed by a lovingly assembled montage of Tove’s black and white illustrations – her vibrant lines need no animation. The producers clearly love her work. 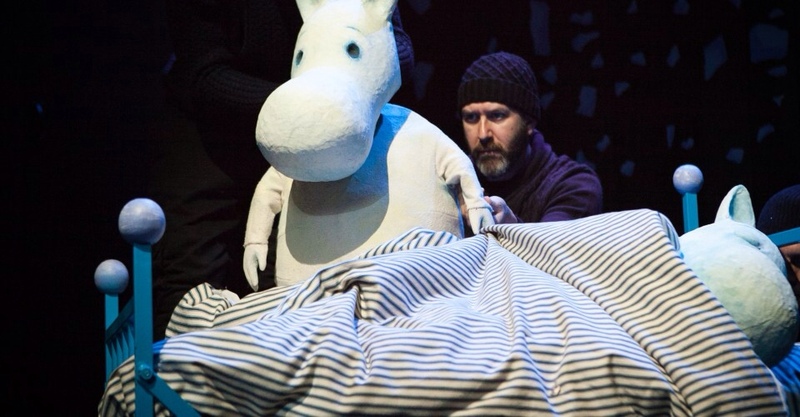 My daughter spotted Moomintroll’s ears poking out of the solitary bed on stage, then pointed out a window with a ladder leading up to it. That’s where he climbs out, she said, remembering the scene we read in The Fir Tree where the moominhouse gets snowed in up to its roof. 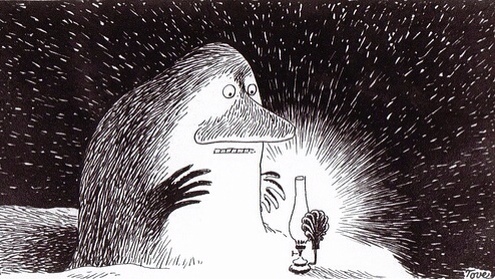 Despite their Finnish setting, there aren’t too many Moomin stories about winter; the troll descendants are no fans of the cold, preferring to bed down together for the duration. This time, for some reason, possibly to do with biscuits, young Moomintroll wakes up far too early from his hibernation. Unable to rouse his sleeping parents, and aided by some brilliant bobble hatted puppeteers, he stumbles out of the window and into the moonlit unknown. The production handles this move from the cosy interior to the scary exterior elegantly and also for laughs. In a cinematic shift we now see the cottage from a distance. 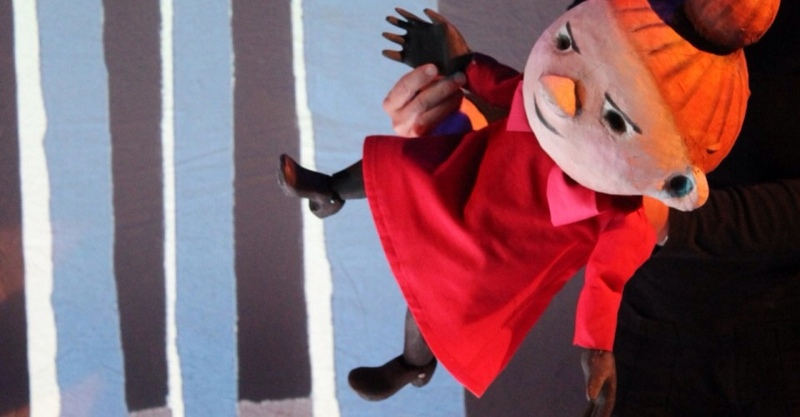 The back of the stage plays host to a set of miniature puppets, and so Moomin stumbles out of the window and tumbles down a snow drift, in a style reminiscent of the 80s cut-out animation. Also awake for the winter are other Moomin favourites, including indomitable, unapologetic Little My. She’s played by Zoe Hunter in, what else, a broad Scots accent. 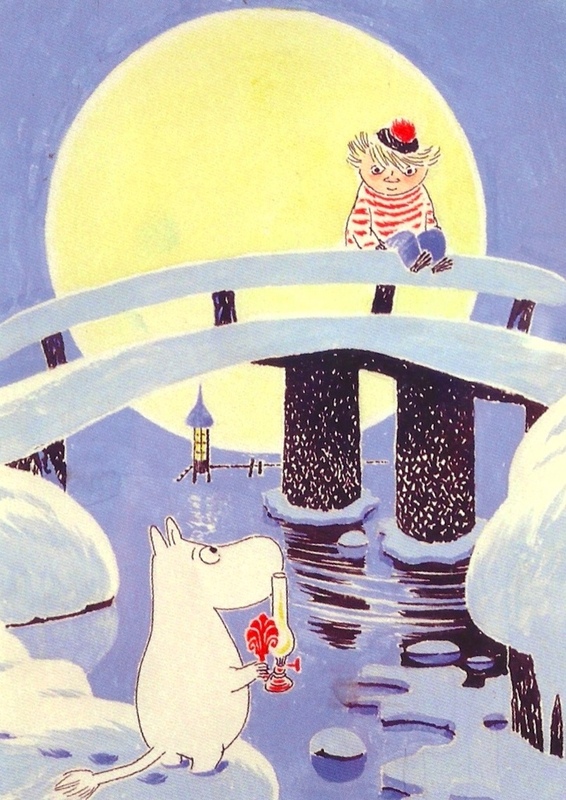 Strangely I’ve never really thought about the Moomin characters in terms of nationality before, they simply were. But after seeing this performance I don’t think I’ll be able to hear her speak in any other voice. It’s great also to see Fillyjonk and her friend Gaffsie turn up too. You might remember them from the remarkable short story The Fillyjonk who Believed in Disasters, about an Afghan Hound lady who lives in all consuming fear of an imagined catastrophe – one which actually turns up in the middle of a full on nervous breakdown. She’s full of the joys of winter here though, taking shelter and eating the Moomins out of house and jam. 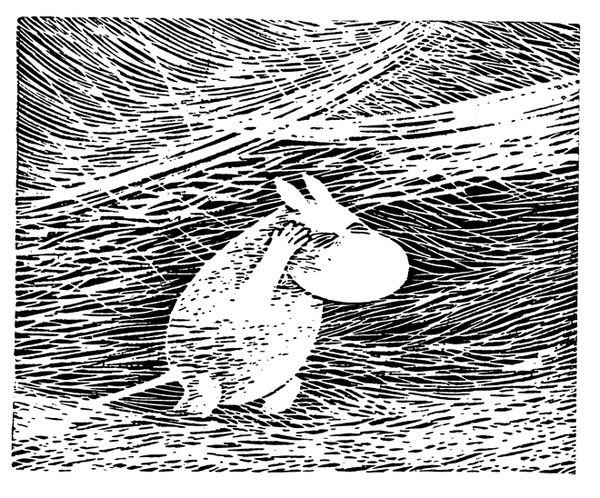 Moominland Midwinter comes with an age advisory of six years and there’s a pretty good reason – this is the story where the Moomin books became far more self reflective, addressing more adult themes. 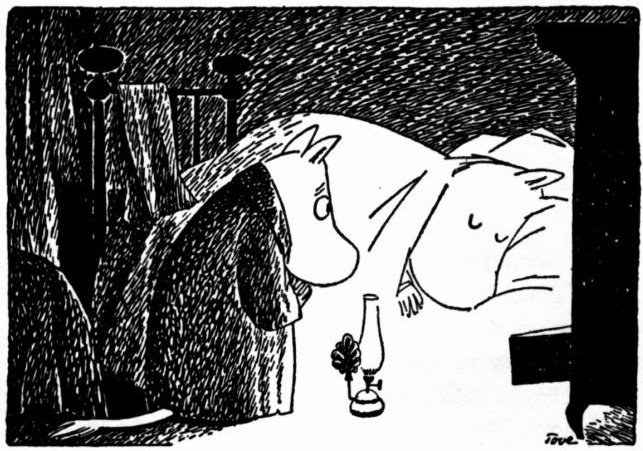 In the book Moomintroll spends much of his time fearful and lonely. The introspection is kept to a minimum here, though writer Hettie Naylor doesn’t shy away from tackling the story’s hardest hitting scene, the death of the lovably ditzy squirrel. The bountifully tailed dolt stumbles into the path of the revered but deadly Lady of the Cold, whose gaze turns the squirrel to ice. Moomin, Little My and Too-Ticky spend some time debating how they should be reacting to the creature’s death – not with sadness it turns out (something they have in common with the young audience). Little My is only disappointed that she can’t turn his lovely tail into a muff. Stunning silhouette combines with projection at the back of the stage, as a bonfire is lit and the frozen squirrel is thrown onto the blaze (along with the Moomins sofa). It’s one of those occasional moments you get in the Moomins, where the focus moves away from the cuddly hippos and settles on something altogether darker and more pagan. Before the fire can burn out though the lonely, warmth loving Groke appears and sits on it, extinguishing the midwinter ceremony. Has the squirrel really been cremated? 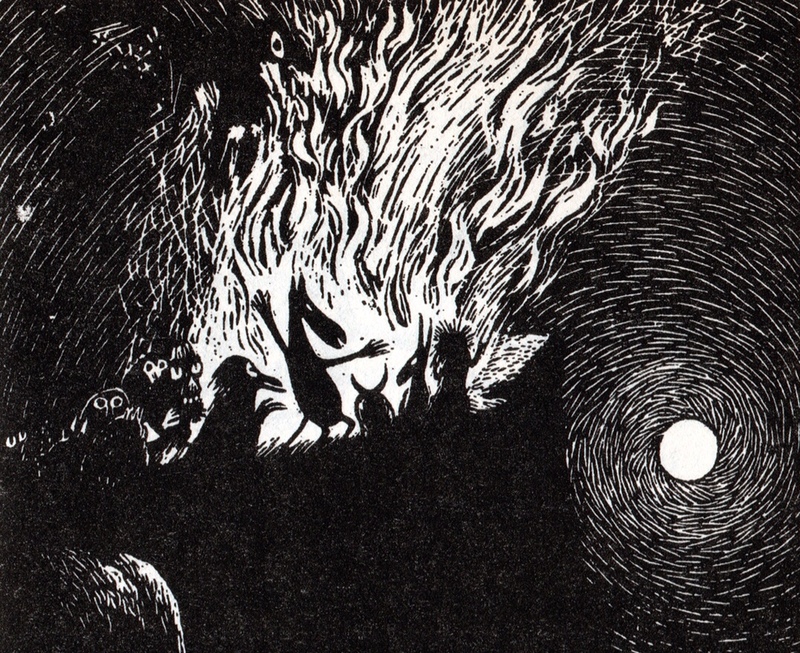 Moominland Midwinter is a fine way to kick off Tove’s centenary year. 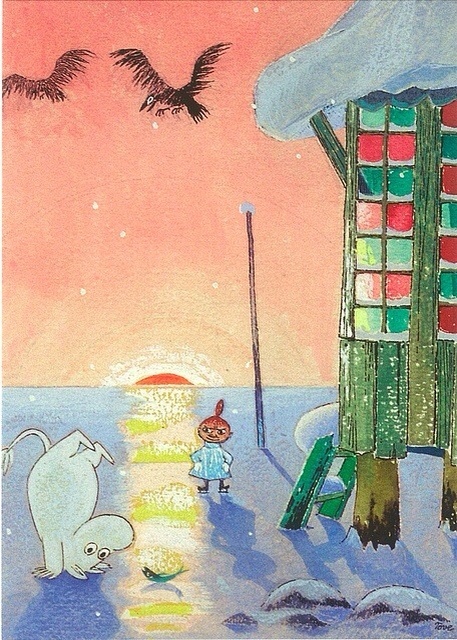 We’ll be seeing a lot more of her creations on the blog over the next year – and not just Moomins. 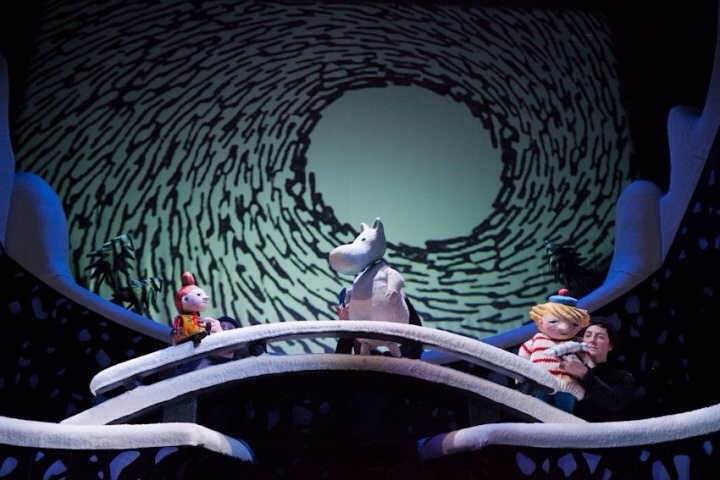 Moominland Midwinter runs until January 12th at The Egg Theatre, Bath. There’s more about Tove 100 here. Tags: Egg theatre, Fillyjonk, Little My, Moominland Midwinter, Moomins, The Fir Tree, Too-Ticky, Tove Jansson. Bookmark the permalink.